Nancy O’Dell-Keim, Director of Tennis and Head Teaching Professional at Spartanburg Athletic Club, is a vital member of our team of dedicated professionals. A native of South Carolina, she developed her passion for tennis at a young age as she grew up in a family of tennis players. This passion continues today evident through her high energy and enthusiasm on the court, as a teacher and a player. Nancy was a top ranked junior player and was recruited by Converse College where she played #1 singles and #1 doubles leading her team to win multiple NAIA (and NCAA Division II) regional championships, advancing to NAIA National Tournament. Nancy’s desire to promote tennis and to share knowledge are apparent through her approach as both a director and a teacher. At SAC, she has successfully created and implemented programs for both juniors and adults while helping cultivate a community of tennis players, teammates, and friends. Her previous teaching experiences include Assistant Teaching Professional for Country Club of Spartanburg; Assistant Head Tennis Professional for Carolina Country Club, Spartanburg, SC; and Tennis Instructor for Thornblade Country Club, Greenville, SC. She is certified in USTA Quick Start (10 and Under) Tennis, and has previously volunteered as a Quick Start tennis coach for The Boys and Girls Club. 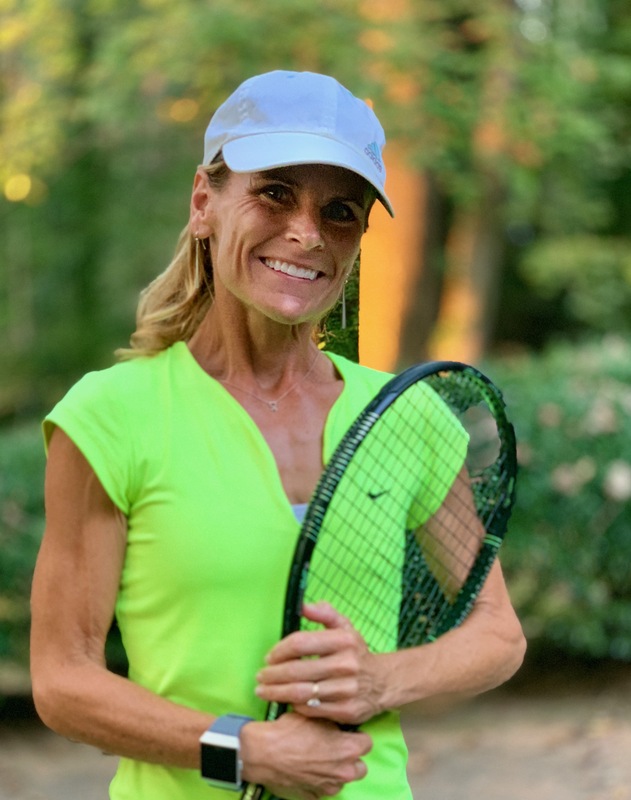 Currently, Nancy is a USTA 5.0 rated player winning multiple State 5.0+ team Championships at the 18+ age division, and she has represented the state of SC in multiple Southern Sectional Championships. Nancy, her husband Scott, and two sons, Jake and Bryce, can often be found at the courts, continuing the family tradition. A high energy ﬁtness activity that combines the best features of the sport of tennis with cardiovascular exercise, delivering a full body, calorie burning aerobic and anaerobic workout. This fun group class is for all levels. If you’ve never played tennis, it is a great way to be introduced to the sport and if you are an experienced tennis player, it is a great way to train for tennis. A minimum of 4 is required. Participants must sign up in advance by texting 864-316-6159. Get into the game and jump-start a lifetime of tennis and ﬁtness! Clinic designed for beginner player or as a refresher course. Basic fundamentals such as proper grips, groundstrokes, court positioning, and scoring will be addressed along with proper movement and correct body mechanics. Level speciﬁc clinic focusing on skill development and practice of skill sets through fast-paced drills and point play. High energy clinic for all levels focusing on the game of doubles through speciﬁc drills and point-play. A minimum of 3 is required. Level speciﬁc, fast-paced clinic which combines competition and cardio through live ball point play. After a brief warm-up, point play begins. Bring on the smack talk! Minimum of 3 players required. Women’s clinic which focuses on doubles drills, speciﬁc strokes, strategy, and point-play. Great opportunity to practice with your doubles partner – Match readiness. A minimum of 2 is required. Clinics will focus on skill development and practice of skill sets through quick drills and competitive games, followed by match play. The last 30 minutes of the clinic will be organized play or a round robin (depending on numbers). Players must sign up for all clinics and events by calling or texting Nancy, the SAC Director of Tennis, at 864-316-6159. Unless otherwise noted, clinics with 2 or less registered will be canceled. Please call for private and semi-private lesson rates. Private clinics for teams and large groups are also available.